During a recent live tweet of Hitchcock’s Rebecca (1940), I was amazed by the outpouring of adoration for Mrs. Danvers. “Always upvote Team Danvers,” one person tweeted, and the hashtag #teamdanvers appeared. This hashtag has been taken over by Marvel comics fans (for Carol Danvers a.k.a. Ms. Marvel), but the example nonetheless illustrates that there are diverse ways an audience can glean pleasure from a film. In this case, there was clear preference for Judith Anderson’s portrayal of the grim housekeeper, devoted to her former mistress, over the earnest “second” Mrs. de Winter, Joan Fontaine. I share this preference, particularly because Rebecca offers little in the way of truly engaging characters despite its gripping narrative tension and mystery in the grand Hitchcock style. Setting and soundtrack overwhelm character development, and in the end the dull pair of lovers pale in comparison to the grandeur of the estate, Manderley, and its dead mistress, Rebecca. Although marriage to Rebecca must have been unpleasant indeed for Maxim de Winter, there was clearly splendor and drama in her era. Danvers’ attachment to Rebecca is connected to the allure of the femme fatale. If one cannot be the fiery beauty who collects men’s hearts and family estates like pretty baubles, one can at least fan her flames. A wing of the mansion is closed off as a kind of shrine to Rebecca. As we learn late in the film, Maxim would never wish to pay her such grand tribute, and for good reason. This monument is seemingly maintained by Danvers’ will alone. Maternal or servile devotion, however, does not fully explain Danvers’ adoration of Rebecca and scorn for the new Mrs. de Winter. To more persuasively address the way Danvers keeps up Rebecca’s former rooms, her voluminous furs and even her costly undergarments, we must consider that something queer is going on here. 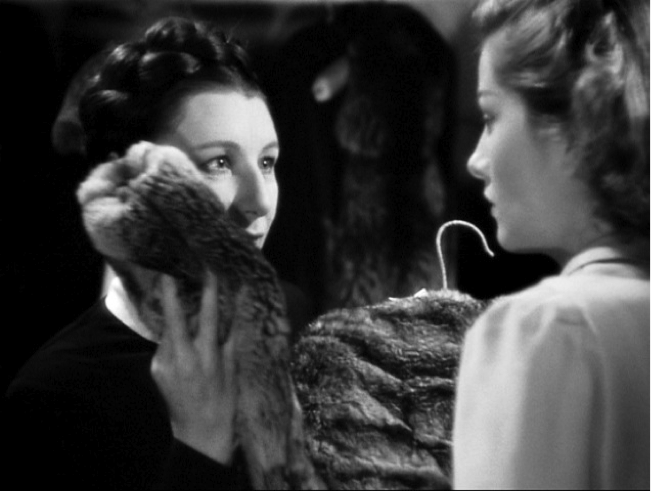 Judith Anderson and Joan Fontaine in "Rebecca"
In “Homosexuality and Film Noir” (Jump Cut, 1977), critic Richard Dyer argues that association with the femme fatale is central to many gay- and lesbian-positioned noir characters. The gay male can be connected to the “luxury milieu” and see the femme fatale as an artistic possession, as with Clifton Webb’s Waldo Lydecker in Laura (1944) or George Macready’s Ballin Mundson in Gilda (1946). The lesbian, by contrast, most frequently serves the femme fatale, leading to a kind of attraction tinged with “tyranny.” We may note that Danvers did not know of Rebecca’s wanton behavior. She loved Rebecca’s elegance and encouraged her haughtiness, but she seemed to have assumed she was Rebecca’s sole confidant, closer to her than anyone else. This misperceived closeness relates to Danvers’ role beyond the domestic sphere. Dyer suggests, “As women with jobs (not just roles as wives, mothers or lovers) they enter the instrumental world, but because they are women they can also act in concert with other women, thus effectively blocking the hero in both the instrumental and the sexual spheres.” This links Danvers and Rebecca as co-conspirators, a role Danvers clearly sought. Such connection, coupled with involvement in such intimate matters as helping her dress, maintaining her boudoir, and brushing her hair, makes Danvers as close to Rebecca’s lover as she could be. Thus, only when the devoted servant realizes her mistress was sleeping with other men does she destroy Rebecca’s shrine and Manderley, along with herself. When she learns that Rebecca did not truly belong to her, Danvers kills herself in the dramatic style of high romance to which her life was devoted: she allows herself to burn down with the house. 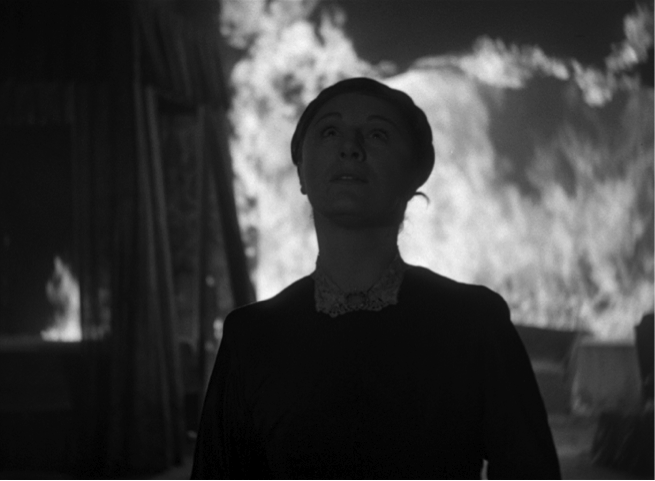 Judith Anderson as Mrs. Danvers in "Rebecca"
Although the film is a noir thriller, the pleasure in viewing from Danvers’ perspective is that of the woman’s film or melodrama, done queerly. Mrs. Danvers has been betrayed by the one woman she loved above all else in life, the mistress she thought was true to her, choosing her companionship even over her husband. When the film is viewed from Danvers’ perspective, we can understand and sympathize with her pain. If Maxim suffers emasculation over Rebecca’s misdeeds, Danvers suffers even more from feelings of intimate betrayal. Maxim finds another woman, less powerful than his femme fatale wife, and eventually moves on. He is still a wealthy, handsome man within a patriarchal culture. Privilege is his.